○ Observers outside the Ningxia Hui Autonomous Region show concern about the pan-halal tendency while local residents are less worried about the role Islam is playing in public life. ○ The Ningxia government has taken measures in response to heated discussions on the pan-halal tendency, including removing guideboards that used to have China and Arabic script and placing clear limits on halal food. As a resident of Yinchuan, Northwest China's Ningxia Hui Autonomous Region, Xia Yi (pseudonym), 29, has noticed some changes to his city - guideboards that used to have Chinese and Arabic script are now Chinese-only and Islamic-style architecture is now rarely shown on local TV. "I noticed that during the recent discussion online about the pan-halal tendency in Ningxia some netizens even referred to the region as 'Ningxiastan,' especially after the controversy over the Ningxia University halal canteens," Xia said. A few online posts complaining that Ningxia University does not offer enough non-halal dining halls snowballed into a national controversy in the middle of August, with many non-Muslim Chinese claiming that Muslims are given favorable treatment to an unfair degree. Xia, who graduated from Ningxia University in 2011, explained that "most of the time we had dinner with classmates of the Hui ethnicity, so we usually went to the halal canteens for courtesy's sake, which became our habit. This may be the reason for there being fewer non-halal dining halls in the campus than the halal ones," Xia said. The Hui ethnic group is predominantly Muslim. "But the discussion on the pan-halal tendency is quite necessary as more and more things related to Islam could be seen in Ningxia in recent years. This may be one reason that some people worry that the pan-halal tendency will extend to everything in our daily lives," Xia said. 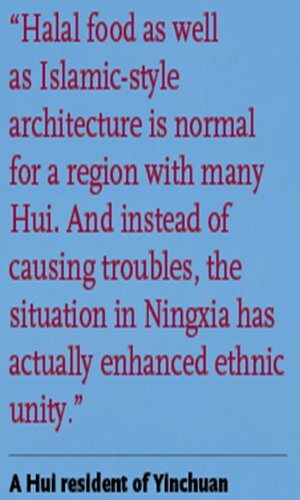 Liu Ta (pseudonym) from Wuzhong, a city where more than half of the population are Hui, told the Global Times that it is normal for cities in Ningxia to be influenced by Islam as so many people living there are Hui, but a good balance should be maintained. According to local government data, Ningxia has more than 2.4 million Hui, accounting for 36 percent of the total population. Visitors who come to Ningxia cannot miss the influence of Hui culture - women wearing headscarves, many snack stands and restaurants identifying themselves as halal, a building that looks like the white cap worn by many Hui men. "Many of the Han people in Ningxia are used to halal food. Not eating pork is a small sacrifice we have made to keep ethnic unity," Liu joked. However, the Ningxia government has taken measures against the pan-halal tendency and Islamic thought influenced by theologies common in Arab nations, which is referred to as Arabization. Labels designating products as halal are needed for some food products, but some firms have labeled water, rice and other daily necessities as halal, which has caused confusion in society, Li Jianhua, secretary of the Ningxia Hui Autonomous Regional Committee of the Communist Party of China, told the media during the annual two national legislative sessions in Beijing in March. Li admitted that there are signs of the pan-halal tendency in Ningxia, but it is not unstoppable. "We should place clear limits on halal food to avoid misunderstandings between different ethnicities," Li said. The Ningxia Ethnic Affairs Commission vowed in May to do well in on ideological work related to ethnicity and religion, and pay attention to related online discussions, read a press release on the website of the Ningxia government. The commission will properly handle the pan-halal and Arabization tendencies, promoting socialist core values and placing national flags in religious sites. The local government has also made efforts to manage public opinion on social media in an effort to eliminate negative influences. Compared with the previous China-Arab States Expos held in Yinchuan, fewer guests wearing Islamic clothing were spotted during the 2017 expo from September 6 to 9. An intern working at a local media outlet told the Global Times that the local government publicity department asked the media not to focus on Islamic factors, including pictures of guests wearing traditional ing or Islamic architecture, especially the Sino-Arab Axis. The Sino-Arab Axis is a scenic spot in Yinchuan erected to commemorate the good relationship between China and the Arab world. At the Axis, a crescent moon sculpture and Islamic-style pavilions are juxtaposed with traditional Chinese architecture. Liu, who does business with firms based in Arab countries, said that he supports the local government's measures to counter the pan-halal tendency but hopes they will not influence Ningxia's exchanges with the outside world. "After all, as an inland region, opening up to the outside would boost local development," Liu said. A Hui resident of Yinchuan told the Global Times that people outside Ningxia may not understand daily life in the region clearly. "Halal food as well as Islamic-style architecture is normal for a region with many Hui. And instead of causing troubles, the situation in Ningxia has actually enhanced ethnic unity," he said. The anonymous resident said that he noticed that the guideboards once written in Arabic and Chinese were removed, which is "unnecessary" since Arabic was simply there for communication, not religious reasons. He said he understands people's worries about religious extremism but said that any attempt to change Ningxia's current situation will fail. 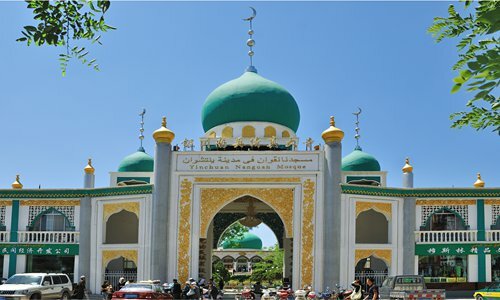 While many Ningxia residents do not seem overly worried about the role Islam is playing in public life there, several controversies have led some outside observers to worry about where this trend may end. The controversy triggered by halal canteens in Ningxia University pushed the pan-halal tendency in the region into the limelight. Many netizens posted data on the growing number of mosques in the region and a video of Hui children reciting the Koran at a kindergarten graduation performance was shared repeatedly. Xi Wuyi, an expert on Marxism at the Chinese Academy of Social Sciences who has been a staunch critic of the pan-halal tendency, has been closely following the situation in Ningxia. She told the Global Times that she was alarmed when heard about proposed legislation on the production and management of halal food. The State Council first tasked the Ethnic Affairs Committee of the National People's Congress (NPC) to draft a national regulation on halal food in 2002. The committee suggested speeding up the passage of the legislation in 2012 and 2015, saying that the legislation was "reasonable and necessary" as it is related to "national unity and social stability." The drafting of a law on halal food was not listed in China's legislative work plan for 2016, after meeting a mixed reaction from the public and many scholars. The national legislation on halal food "violates the principle of separation of State and religion" and if the bill is enacted, it will interfere with the practices of religious followers in different regions and may threaten "China's national security strategy," Xi said, adding the legislation on halal food might also lead the pan-halal tendency to extend nationally. Xi warned that pan-halal is the first step toward religious extremism. "Religious extremism gradually permeates into society by influencing people's basic way of life. It will gradually strengthen religious fundamentalism, promote the pan-halal tendency and eventually realize the politicizing of religion," she said. "It is not easy to define the generalization tendency in a religion. But there should be some limits on a religion when it enters into a society. Once a religion invades public life too much, it shows the generalization tendency. For example, if a Buddhist asked all non-Buddhists to become vegetarian, we could call it pan-Buddhism," Li Xiangping, a religious studies professor at East China Normal University in Shanghai, told the Global Times. Li Xiangping said that the expansion of any religion in society might hurt other groups' interests and cause confrontation. "But the current discussions on religious issues in China lack reasonable interactions," he said. "Netizens who make anti-Muslim comments during the discussions about the pan-halal tendency have misunderstandings about the religion, including linking it to extremism and terrorism. And the stigmatization of Islam is wrong," an expert on religious studies who asked for anonymity told the Global Times. The expert said that there is an increasing tide of Islamophobia, especially on social media, with some netizens calling Islam the "green disaster." "Islam is not terrorism. It is not the religion's problem, it is because some terrorists and extremists are using the religion to instigate believers to commit terrorist attacks," he said.